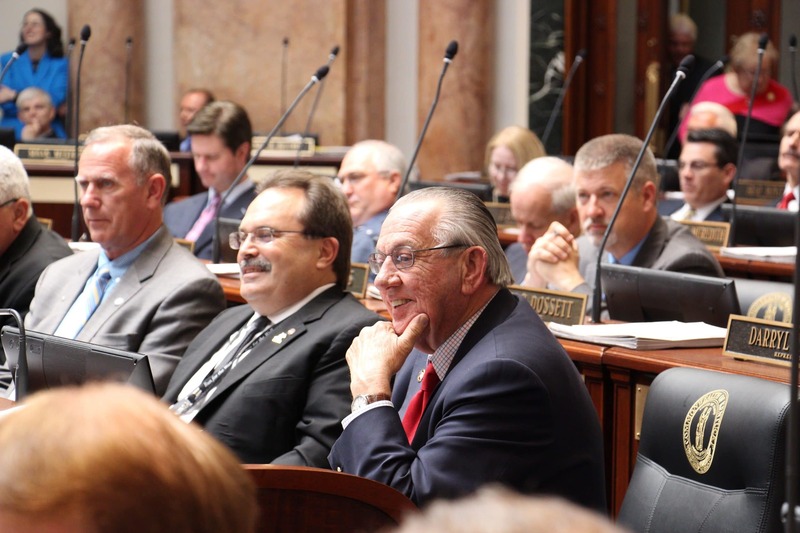 FRANKFORT – Following the General Assembly’s near-unanimous approval this evening of a budget that will run state government for the next two years, House Democratic leaders said they were “extremely pleased” that proposals the chamber championed were included. The House leaders include House Speaker Greg Stumbo of Prestonsburg; House Speaker Pro Tem Jody Richards of Bowling Green; House Majority Leader Rocky Adkins of Sandy Hook; House Majority Caucus Chair Sannie Overly of Paris; and House Majority Whip Johnny Bell of Glasgow. Other House initiatives in the budget include increasing preschool eligibility to 200 percent of the federal poverty level, up from the current 160 percent; ensuring all state lottery proceeds go to scholarships and educational programs; increasing the amount of coal-severance dollars returning to the coal counties that are reeling from declines in the industry; and expanding the Court Appointed Special Advocate Program (CASA), which helps children involved in abuse and neglect cases. The House also was able to preserve prevailing wage provisions that ensure workers on state projects earn a fair wage. Governor Bevin had sought to remove that protection in his budget proposal. A breakdown of the budget is below. There is more than $1.2 billion in new money for the retirement systems for teachers and state employees. This will be paid in part from 9 percent cuts to many state agencies and from an estimated $900 million in new dollars over the biennium. There will be $125 million in a new permanent pension fund for future costs. The governor had requested $500 million initially, but the House believes more should be used this cycle to go directly into the retirement systems. The budget also calls for a performance-based audit of the two retirement systems. The House was successful in exempting all K-12 programs from any cuts, including family resource and youth services centers, textbooks, and professional development. Note: SEEK, Medicaid, criminal justice and veterans programs are exempt as well from the 9 percent cuts. The House was successful in raising preschool eligibility to 200 percent of the federal poverty level. A new grant program will also allow a school district to send a teacher to a private daycare to teach preschool. The House was successful in maintaining the “Powerball Promise” by returning virtually all state lottery proceeds to KEES scholarships and CAP/KTG programs. This budget provides $93 million for urgent-needs schools, to reduce the number of old and dilapidated facilities our students and staffs now use. There are no funding cuts for the Kentucky School for the Blind and the Kentucky School for the Deaf. The budget cuts higher education by 4.5 percent, which is half of the 9 percent cuts the governor and the Senate wanted. The budget does not address current-year cuts to universities, which are being litigated by Attorney General Beshear. Kentucky State University is not involved in the cuts, due to its budget crisis. The budget also sets up a framework to implement performance-based funding for Kentucky’s public colleges and universities. The budget includes $25 million over the biennium for the House’s “Work Ready Kentucky” scholarship program. This will be used to cover remaining tuition costs high school graduates may have if they attend a public or independent college or university the following fall that offers associate degrees. This is the “last dollar in,” because the amount will depend on how many other scholarships and grants a student receives. Requirements include maintaining a 2.5 GPA in college and 15-hour course loads. They will also be eligible for the scholarship during four out of six semesters, and if they drop out during a semester, they will have to pay back that semester’s scholarship. The budget also expands a separate dual-credit program high school students use to earn college credit. This will help many schools that otherwise cannot pay this cost. There will be more General Fund dollars returning to coal counties. The House goal is to eventually return 100 percent of coal-severance dollars to them. $100 million in bonds will be issued for facilities designed to help Kentucky’s skilled workforce. No more than 25 percent can go into a single congressional district. Kentucky State Parks will receive money for life-safety projects, to make repairs that could cause injury if not fixed. $2 million over the biennium will be used to build and improve local libraries. The budget includes $60 million for the Lexington Convention Center, which would be part of a $250 million expansion. The Louisville Waterfront Development, Northern Kentucky Waterfront Development, and Louisville Botanical Gardens will also receive additional funding. The Judicial Branch will have funding as the chief justice requested. Constitutional offices will be cut by 3.375 percent. Kentucky State Police trooper raises are funded. The budget provides more money for heroin and drug treatment. The budget calls for state mine-safety inspections to mirror the number of federal inspections, as the House proposed. The CASA program (Court Appointed Special Advocate) will receive $3 million to expand further statewide. CASA helps children in abuse and neglect cases. KET will not be cut. The budget does not limit prevailing wage.